Enough with the princess nonsense! In the Works: Cinderella Film with Emma Watson? After perusing the traffic statistics for this blog, I was surprised to learn that one of the top three most visited entries so far has been The Princess and the Pea Craft. Since August starts tomorrow and brings with it the decline of the summer school break for most kids and their parents, at least here in the states, I thought I'd offer up another fun Princess and the Pea activity: The Princess and the Pea Cake for the weekend. The link takes you to a recipe and crafting instructions. The headboard could easily be adapted for children's creation, for example, using cardboard or even the kids' ubiquitous popsicle sticks instead. An appropriate-sized doll could be the princess. There's many ways to make this cake a simpler but still fun project if your decorating skills are inexperienced at best. See this one if you feel inadequate because it's charming but realistic for the usual at home baker. (And don't worry, Cake Wrecks only features professional cakes, not ones made at home!) I love the idea of using a green M&M for the pea, so don't forget that fun detail! 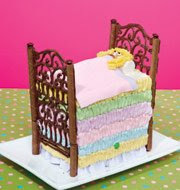 And, of course, I had to do a quick search of Princess and the Pea cakes and found this wonderful one by SevenCakes.com which appeals not only for its quality but in that the princess actually appears to be having a sleepless night. So many illustrations and otherwise forget that the fairy tale is about not being able to sleep on the pea! And if you look closely at the bottom right hand corner, you'll see a pea pod with a pea missing. And a crown hanging on the bedpost. There's also more detailed photos of the cake on the main site. Love, love, love it! My favorite of all I've seen. There's lots more cakes on the web, such as here and here and here (a black princess! ), but for the sake of time and space, I'll refrain from sharing them all. Just remember that search engines are your friends if you want to see more and discover that many minutes have evaporated while looking at cakes. By the way, the entry about the Nail Polish Giveaway has been the most popular so far for obvious reasons. The first bottle will be given away a week from today! Bluebeard is the main character in one of the grisliest and most enduring fairy tales of all time. As the story goes, a new bride is left alone by her husband and given free reign of their house, save for one room that she is forbidden from entering. Almost immediately she gives in to her curiosity, discovering a bloody chamber holding the corpses of his previous wives. Upon his return, the husband is enraged and attempts to murder her as well. Astonishingly, the tale of Bluebeard and his many wives was a nursery staple, one of the tales translated into English from Charles Perrault’s French Mother Goose Tales. Bluebeard: A Reader’s Guide to the English Tradition (University Press of Mississippi) is the first major study of the English tale and its many variants. The book presents examples of English true-crime figures, male and female, who have had the label Bluebeard bestowed upon them, from Henry Tudor to the present; rare chapbooks and their illustrations; and the English transformation of Bluebeard into a scimitar-wielding Turkish tyrant in the massively influential melodramatic spectacle of 1798. Casie E. Hermansson also details the impact of the nineteenth-century translations into English of the German fairy tales of the Brothers Grimm, and the particularly English story of how Bluebeard came to be known as a pirate. The authors and artists who have engaged with this story comprise a “who’s who” that is three centuries long. Bluebeard: A Reader’s Guide to the English Tradition will provide readers and scholars an invaluable and thorough grasp on the many strands of this tale over centuries of telling. Not sure exactly how it compares to Maria Tatar's Secrets Beyond the Door, but it's wonderful to see more scholarship for Bluebeard being published. I imagine this will be a great resource for professors and students especially. Steps from the property wood. O, what a face full of fangs! Roll to seduce and beguile. Caught as she closes her jaws. Bows, all sugar and spice. O, what a lady-like trick! O, what a round of applause! from An American Anthology, 1787–1900 (1900). 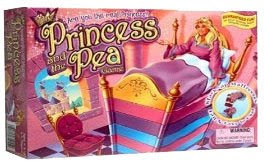 So, yes, there are TWO board games for children inspired directly by Princess and the Pea, quite different and I'm not sure which one is more fun. I don't own and haven't played either, but the reviews are overall favorable for both, although they are most recommended for the under five-years-old set. I just know I would have adored the games as a child and am still charmed by them decades later. 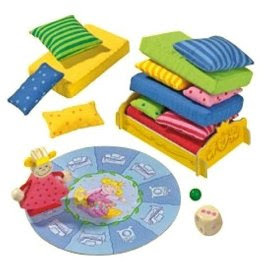 The first, Princess and the Pea Board Game, is more of a traditional board game where you add mattresses to your own bed as you move along the board. Just like Hans Christian Anderson's beloved fairy tale "The Princess and the Pea," the prince is searching for a real princess. In this game you move your bed along the board adding mattresses to it as you go. To win you need to build the highest bed and reach the special "crown" space! Are you the real princess? The second game, Sleepy Princess and the Pea, appears to be more of a variation on Jenga where all players build the one bed with mattresses and try not to let it topple over. Is she really a princess? the queen asks herself as she makes a tricky challenge to test the damsel. You are the queen's eager helpers and you must prepare the bed for the little princess. You have to be careful and skillful as the queen wants her to sleep on a wobbly pile of mattresses. Together you try to help the princess with the stacking of the mattresses. 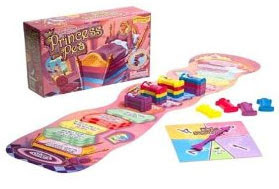 This game includes 2 fairy tale games of skill for 2 - 4 players ages 3-12 with the fairy tale "The Princess and the Pea" a story to read again and again. So both games have used the same theme but differently. Both are also well-reviewed and recommended by parenting groups. Note that neither are Disney princess games either. Impressive. I discovered this upcoming title last week which has almost no information available yet. There's not even a cover image available on Amazon or the Routledge site. (Yes, I find that more times than not, Amazon has the image before the publisher does on their respective sites.) However, just the title makes me hope it will be added to most university libraries for all the students out there who write on this topic. Alas, Routledge doesn't tend to send out review copies and SurLaLune doesn't have the budget to acquire much of the expensive nonfiction and review it. However, I will keep my eyes open for extended information on the title to help encourage the library requests, at least. I'm sure this will be of interest to the many students writing about Disney and beyond, many of whom come seeking information on the SurLaLune Discussion board. Official sources like these are a blessing, but only if the university libraries add them to their collections. Troll's Eye View: A Book of Villainous Tales edited by Ellen Datlow and Terri Windling is the third in a series of short story collections of fairy tale retellings, following A Wolf at the Door and Swan Sister. I know I always care more about the contents of a short story collection like this than a review, so I'm kindly sharing the list with my gentle readers, too. Most of the authors are the usual suspects for a collection edited by Datlow and Windling, so fans should be thrilled and newcomers have a treat in store. There is a mixture of fun and trauma in the stories, ending with Link's chilling "The Cinderella Game." Don't read it at bedtime if you are subject to nightmares. Otherwise, go on out and buy this to encourage the publication of more Datlow and Windling collections in the future. Their names insure quality after two decades of collaboration. Yet another using fairy tales for teaching application offered up by Wellesley Recreation in Massachusetts next week: Fairy Tale Princess Cooking Class and Tea Party. I think it is a clever concept, teaching cooking, entertaining and manners to young children--note that it's calling all princes and princesses despite the course title. Calling all princes and princesses. The time has come to prepare for the Fairy-Tale Princess Tea Party. We will learn to make a meal and serve it with style. This 4-day camp will culminate with a Fairy-Tale Princess Tea Party, hosted by the children for their guests. We will spend the first two days practicing our kitchen skills by preparing our own lunchtime feasts. We might make Ugly Step Sister Stew, Snow White’s Apple Strudel, or Prince Charming’s Roasted Chicken. During the final two days we will be busy preparing treats for the tea party. Delight your guests with Crown Jewel tea sandwiches, Belle’s mini quiches, Princess Fiona’s fruit parfaits and more. Godmother: The Secret Cinderella Story by Carolyn Turgeon slipped past my radar for a few months since it didn’t appear in any of my regular searches and alerts for new fairy tale related fiction. I try, but many slip between the cracks to my chagrin. I am an Amazon Vine reviewer and was surprised when I found this book as one of my choices for the month. I buy most of the books that I get for SurLaLune, so I always appreciate review copies. I plan for this blog to be one of my methods for singling out new titles in the future. Unlike many of the reinvented fairy tale novels published recently, Turgeon’s Godmother isn’t aimed at young adult readers, but adult readers, with its edgier and more enigmatic handling of the content. It reminded me somewhat of Gregory Maguire’s work in the genre than any other author’s although Donna Jo Napoli and several short story authors have lots of sharp corners in their stories, too. I found myself thinking about Napoli’s masterpiece The Magic Circle every so often while reading this novel since both offer similar themes of older women seeking redemption from past mistakes. Godmother is the story of Cinderella’s godmother, banished to the mortal world after her bad handling of Cinderella and the prince. This godmother, Lil, barely resembles the usual fairy godmother imagery. She is not a benevolent, rather flighty, bringer of good fortune. Well, at times, yes, she is, but not in the expected ways. Lil is bereft from her losses and lonely although blessed with friends and people who care about her in the mortal world. Now that she is banished, stuck living in New York City and working in a small rare bookstore, she desperately wants to return home. She is desperately trying to re-earn her wings to borrow the cliché of angels. She finds a new woman, Vivian, she hopes to help and thus redeem herself. The story unfolds, mixed with flashbacks to 300 years earlier when she first tried to help Cinderella win her prince. There are a few surprises and twists and an ending that will most likely either satisfy or frustrate the reader. This book explores the psychological side of the character while still telling an interesting story. It’s a fairly easy read, not an overly heavy or long one—it’s considerably shorter than anything by the above mentioned Maguire, for one thing. I’m still digesting it, not adoring it, but enjoying it all the same, more intrigued than anything. So yes, I recommend it. I admit the book sat on my stack of TBR books (always an overwhelming stack) for a while since the reviews had been mixed and I was reluctant. Consequently, I ended up liking the book much more than I expected to. If the subject and themes interest you, try it and don't put it down until the end which will hopefully make it all worthwhile for you. Fables by Bill Willingham makes a short appearance this week on the Wall Street Journal's Speakeasy blog: "Fables" Brings Fairy Tales in Modern Era. Those in the know, know that Willingham's Fables and spin-off Jack of Fables have been around for several years now. Have any writers ever said they wanted to kick themselves for not thinking of this idea sooner? However, Willingham has a new Fables universe prose novel--not graphic novel--coming out in October which he is promoting on WSJ and at the upcoming Comic*Con in San Diego. The novel is Peter and Max and Willingham pre-announced it last year on the SurLaLune Discussion boards, too. A new stand-alone FABLES NOVEL from award-winning and wildly acclaimed author, Bill Willingham. This story stars Peter Piper and his incorrigible brother Max in a tale about jealousy, betrayal and revenge. Set in two distinct time periods, prepare to travel back to medieval times and learn the tragic back-story of the Piper family, a medieval-era family of traveling minstrels. Then, jump into the present to follow a tale of espionage as Peter Piper slowly hunts down his evil brother for a heinous crime, pitting Peter's talents as a master thief against Max's dark magical powers. Based on the long-running and award-winning comic book series FABLES, PETER AND MAX is its own tale. Readers don't have to be familiar with the comics to fully enjoy and understand this book. I have images and links for all the graphic novel compilations from of the two series available here: Graphic Novels on SurLaLune. There's an average of two releases each for the two titles each year. I'm happy the series is going strong and has grown in popularity. Well, it's almost exactly a year away from release if the dates don't change, but Beastly, based on the novel by Alex Flinn, is currently slated for July 30, 2010. The movie stars Vanessa Hudgins (High School Musical), Mary-Kate Olson, Neil Patrick Harris (Dr. Horrible) and Alex Pettyfer in the title role. Pettyfer doesn't have a long list of acting credits so far, but he also starred as Alex Rider in the Stormbreaker adaptation a few years ago, so he's not a stranger to novels turned into films. At first, one doesn’t realize that this novel will be modern day since the opening chapters present us with Talia, the cursed princess of Euphrasia. Talia (her name hearkens back to the Italian Sleeping Beauty: The Sun, Moon, and Talia), has been sheltered and never left alone for fear that she will either die or fall into a long sleep, taking her entire kingdom with her, if she touches a spindle. Just before her 16th birthday, the last day of the curse, she is tricked by the wicked fairy Malvolia into touching a spindle. The entire kingdom, not far from Belgium apparently, disappears from world view while it sleeps along with her. Three hundred years pass until Jack is traveling around Europe, bored and somewhat rebellious. He and his best friend discover the sleeping Talia. Jack is compelled by her beauty and ends up kissing her, breaking the curse and awakening the entire forgot kingdom. Of course, the happily ever after doesn’t arrive then. He discovers that Talia is rather spoiled and demanding. He isn’t too excited about finding true love either, since he’s not very enamored with his own life or situation either. Still, Talia and Jack are compelled to be together for various reasons despite all their conflicts. Many adventures ensue as they learn and grow-up and manage to build a relationship along the way. A 300 year age difference is rather daunting and they are faced with the extra burden of Euphrasia needing to learn how to function in the 21st century. The novel isn’t perfect and borders on the too sweet at times despite the somewhat caustic hero and heroine. However, the elements that made it not quite perfect for me just might endear it to its young adult audience looking for fun fairy tale escapism. It is a fun romp and a fine new interpretation of the classic tale, quick to read, and entertaining. I've been busy sorting through my backlog of blog ideas and have managed to post for several weeks without discussing, promoting, reviewing, or saying much of anything about books beyond the bargain books post last week. Shocking! Granted the summer months have been slow with few new releases using fairy tale themes, but there are always some and I have neglected new books and fairly recent books and oldies but goodies, too. To make up for the lack, this week's posts will focus on recent releases from 2009 in fiction and nonfiction. I'll be adding and updating titles to the mainsite, too, since I'm a little behind there. The game itself is interesting, not one I have ever read about, but it definitely won't be for everyone since it goes beyond light escapist entertainment and unabashedly calls itself a horror game. However, it sounds like it can be an empowering experience for players interested in it. The point of the game is to face the wolf and deal with him, facing the dangers of girlhood and womanhood, often very real ones. In my mind, after exploring the links, I thought of it as the female version of Call of Duty, one of the video games that is too real and can be traumatic for veterans. The Path uses Little Red Riding Hood to recognize and confront the dangers of everyday living for girls. "I think we've succeeded in making a game that's about the player," says Samyn [one of the game's creators]. "What's frightening about it is the confrontation with your own interpretation of things, and probably realizing that they're your own." 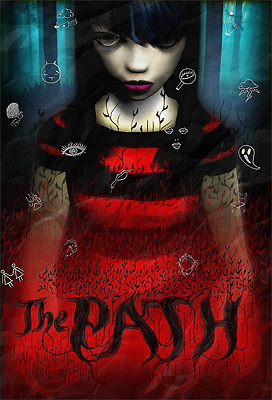 The official game site is here: The Path. The game is available for either Windows or MAC platforms. For Ages 15+. While The Path does not contain any graphic violence or sexuality, it does allude to these themes. 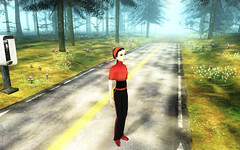 The overall melancholy mood of the game and the potentially unsettling course of events, make The Path unsuitable for children. This week the Victoria and Albert Museum opened a new exhibit, Telling Tales: Fantasy and Fear in Contemporary Design. This exhibition explores the recent trend among European designers for unique or limited edition pieces that push the boundaries between art and design. It showcases furniture, lighting and ceramics, designed by a new generation of international designers, including Tord Boontje, Maarten Baas, Jurgen Bey and Studio Job, who are all inspired by the spirit of story-telling. Each tells a tale through their use of decorative devices, historical allusions or choice of materials, sharing common themes such as fantasy, parody and a concern with mortality. The exhibition is in three sections: The Forest Glade is inspired by fantasy and nature evoking the spirit of fairytales. The Enchanted Castle exaggerates and parodies historical design styles often associated with displays of status. Heaven and Hell is concerned with themes of mortality and the afterlife. I love the V&A and only wish I was going to see this exhibit in person, but alas, no trips to the UK are in my immediate future. Fortunately, the online exhibit gives a nice overview and taste. This exhibit is open through October. You can also read some of the Guardian's article about it at: Review: V&A's Telling Tales show gives furniture a fairytale twist. This charmingly named restaurant, Rumplestiltzkin's, received a nice write-up in The Berkshire Eagle in Lenox, Massachusetts this week: Rumplestiltzkin's: For a fairy tale feast. The restaurant was named for the family dog which was apparently named for the fairy tale. Sounds like good fun in either the restaurant or adjoining Rumpy's Tavern if you ever happen to be in the area. I'd be tempted by the gingerbread sundae for dessert which appears to be one of the few themed items on the menu although the article doesn't list any names. I doubt there is much since the restaurant is striving to be taken seriously for fine dining with just a bit of whimsy thrown in. I prefer good food with a touch of whimsy instead of cardboard where the theme reigns supreme. Here's the only website I could find for the restaurant: Rumpelstiltzkin's Restaurant. Some sample menus are listed on it. Like most fairy tales, "The Frog Prince" is a mordant little morality tale that cautiously suggests a lady needn't be so choosy when picking a suitor. Even the more sanitized, and Americanized, versions of "The Frog Prince" offer this moral: personality counts! Allow yourself to be charmed by a talking frog and you'll be rewarded. But first, you should be happy with only a talking frog. In fact, you should be so lucky to kiss him. Well, that was a little more like it. Fairy tales aren't being attacked in the article, but the attitude that is attributed to them by parts of popular culture. That was a relief. So read and think, perhaps have fun with it. And save the bookmark for December when Disney's Princess and the Frog comes out. Cause this article came out about five months too soon. And may I compliment John DeVore on actually doing his research. This is one of the first pop culture articles in a while (anything for The Frisky has to fall into that category) that accurately referenced fairy tales and their history. That was nice and since I agree more than disagree with the sentiment, I'm even more impressed! After all, traditional fairy tales are not just the Disney versions with refrains of "Some Day My Prince Will Come." And even that one is older Disney, dare I even say the original Disney, not the Disney of this century, to be fair to Disney who has helped to keep the genre alive. Remember that any publicity is good publicity. And, since you're here reading, I consider princess culture to be more based on the desire to feel cherished and special by someone or a few someones. Yes, there's the money-grubbing, lineage caring kind, but most little girls (and big ones) are just wanting to feel wanted, desired, cherished, that they matter to someone. Not necessarily everyone, just someone. That's not a bad thing. It's twisted sometimes into something rather unattractive, I admit, but most women I know have a mostly healthy perspective on it all. And they use fairy tale metaphors to convey it the way men use sports metaphors. It's part of the common experience. The real fairy tale to me is that we grow up and are bombarded with imagery of what we should look like (airbrushed supermodels), what we should do (executives who also have a clean house with young children), etc. and never feel like we can measure up again if we don't have that love for ourselves and perhaps some extra from a few special people to help us overcome the message that we will never be perfect enough or everything to everyone. All that is said by someone who was once a young girl much more interested in books and building houses with her blocks for her one Barbie than playing dress up or dolls. It's a tough world and we all need a little fantasy to survive it. It's when there's unhealthy or unrealistic expectations in real life that things get dangerous, but fairy tales aren't the culprits. And in the end, I think DeVore's message is the same, actually a plea on behalf of the male gender. Real people have a hard time living up to the fantasy, so let's make sure the original message of the tales are remembered, not the newer ones maligned by the masses. Coming up: I'm gearing up for a week of book reviews next week after the admitted frivolity of nail polish and such the past few weeks. I'm going to be reviewing some of the new releases from the first half of 2009, so stay tuned if you've already exhausted your summer reading pile. Storytelling is close to my heart since it goes hand in hand with fairy tales and folklore. So don't miss this article, Fairy tale ending for young storyteller, about Olivia Merryman, the 8-year-old "who was named the annual competition's elementary level "torchbearer" June 6 as the best in her age group" at the National Youth Storytelling Showcase last month. And isn't Merryman just a perfect name for a storyteller anyway. I hope she has a long career. On Monday, I discussed the BB Couture Fairy Tale Collection and announced a contest. I also promised to mention the China Glaze Glass Slipper nail polish collection that appeared in 2004 and is now, alas, discontinued. China Glaze used Cinderella as inspiration for naming the polishes in this collection. All of the polishes had shimmers or glitter finishes. I couldn't find images of all the bottles although there are swatches on nail polish blogs if you search for such on Google. I did find an article with a brief paragraph about the collection however. I like that Prince Charming is not included. Helps set the collection apart from the ones by BB Couture and Orly, although the Prince Charming colors are some of the more interesting additions in those collections. OPI is the most popular nail polish brand in the world, but to my knowledge they have never produced a specific fairy tale themed collection. They do have Fairytale Bride from Spring 2009, but that is for brides and not fairy tale influenced. The company occasionally references fairy tales and nursery rhymes in their clever color names, such as previous releases called Fee Fi Fo Plum, And This Little Piggy..., Goldilocks Rocks!, Rinse Charming and others. These colors by OPI and Orly can be found at discount retailers online such as Transdesign or Head2ToeBeauty. SurLaLune is not affiliated with any of these stores. I'm supplying the links to help you find the polishes if you are interested. And don't forget to enter the giveaway for a bottle of BB Couture and Orly Nail Polish! I have planned the BB Couture giveaway (see yesterday) and an additional post on the China Glaze Glass Slipper collection (see tomorrow) for over a month. Then last week, Orly announced their Fall 2009 collection, Once Upon a Time... Well, the timing was rather perfect for SurLaLune so I researched the collection and decided to have three nail polish posts instead of my original two this week. The Orly collection is primarily influenced by Snow White and the Seven Dwarfs and general fairy tale tropes. Funny how each of these collections repeats ideas but shows different influences, too. Prince Charming and Poison Apple are favorites for names and Happily Ever After shows up in a lot of brands that don't have full fairy tale themes. This collection is a little more unusual for Orly and I think will appeal to those of us who are looking for unusual colors, such as green and grey, in nail polishes although there are the ever popular red tones included, too. These colors by Orly are just being released and can be found soon at discount retailers online such as Victoria Nail Supply, Transdesign or Head2ToeBeauty, or at brick and mortar Sally Beauty Supply stores. Ulta also carries Orly so the collection will probably appear there as well. SurLaLune is not affiliated with any of these stores. I'm supplying the links to help you find the polishes if you are interested. Thanks to Kim at Overall Beauty for her donation to SurLaLune! A SNEAKY midnight feast is about as far as hell-raising goes at Hogwarts. So I worry how EMMA WATSON is going to cope with her new film role. The Harry Potter star is teaming up with drug-guzzling shock-rocker MARILYN MANSON for a musical. The pretty teen has been handed a part in a Goth-inspired reworking of glass slipper fairytale Cinderella. She will play a princess in the as yet untitled film being masterminded by the singer. A musical, no less. With Marilyn Manson. I doubt it will bear any resemblance to The Slipper and the Rose (my favorite Cinderella musical) or any rendition of Rodgers and Hammerstein's Cinderella (of which Julie Andrews is my favorite). And I must say I imagine Manson producing Little Red Riding Hood more than Cinderella, but it's nice to be unpredictable. Yes, SurLaLune is having its first giveaway. See the bottom of this entry for more information. I'm allergic to most makeup and therefore don't use much of it. However, I am a fan of color and thus love nail polish. Over the years, there have been a few special collections from various nail polish companies with fairy tale themes. One collection by China Glaze is no longer in production although it can still be found online. I will write more about it on Wednesday. Also, for Fall 2009 Orly has released a six color collection called, Once Upon a Time. I'll show images of this collection tomorrow. What is probably my favorite fairy tale nail polish collection has been out for a short while and is still very much available. It's the Fairy Tale Collection by BB Couture, an excellent but not well-known nail polish company. The BB Couture Fairy Tale collection polish names are most heavily influenced by Sleeping Beauty--with a slight Disney influence--although there is also a nod to Snow White with Poisoned Apple. While these six polishes comprised the official set, several other polishes by BB Couture use fairy tale and fantasy themes such as Fairy Tale Romance, Fairy Blood, and Pixie Dust. The all-time bestselling color is Poison Ivy which was originally slated for the Fairy Tale Collection, but ended up with a different name as a stand-alone instead. It's one of my favorites, too. It might not have been as popular with a name like Beanstalk or Frog Prince, but I like to think it would have. The BB Couture polishes are not readily available through brick and mortar stores, but they can be ordered from their website. I usually order my polishes from Overall Beauty, a licensed distributor for BB Couture. When I placed my most recent order, I added a comment about SurLaLune to Kim, the store's owner. Kim kindly added three polishes from the collection to my order to give away to SurLaLune's visitors: Prince Charming Blue, Kiss of True Love and Poisoned Apple. I am going to give away one polish every Friday in August. I will give away a bottle of BB Couture on the first three Fridays in August on the 7th, 14th and 21st. 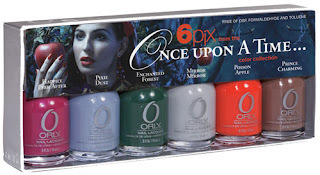 Then on August 28th I will give away a bottle of Orly's Enchanted Forest from the new Once Upon a Time Collection. You may only enter once and your name will stay in the giveaway for the entire month unless you win. Winners are limited to winning once a month. If you win, I will contact you by email and ask for your mailing address. If I do not receive your mailing address within three days, I will pick another winner. Unfortunately, this SurLaLune giveaway is limited to the United States. I know SurLaLune has a large international audience, but nail polishes are considered hazardous materials and are thus difficult to ship to many other countries. If you find you must own these polishes, Overall Beauty does ship internationally. Don't worry, I will have other giveaways in the coming months that will be open to my international readers such as books and other materials. For the last few years, the BBC has been airing modernized movie-length retellings of classic literature. First was Canterbury Tales in 2003 which hasn't been released stateside. That was followed by Shakespeare ReTold (US link and UK link) which also aired on BBC America. Most recently, the series offered Fairy Tales in 2008 which included movie treatments of Cinderella, Rapunzel, The Three Billy Goats Gruff and The Emperor's New Clothes. For some reason, the DVD set for Fairy Tales  has never been released in the states, but it is available at over well over 50% (63% off at the time of this writing) from Amazon.co.uk right now. Actually, all three series are listed at deep discounts for a short time if any of the above interest you. Just follow the links provided. I haven't seen these movies but have been eager to see them for well over a year since they were first announced. The DVDs from AmazonUK are Region 2 but if you have a region free player, they should play without a problem. Here's a link to the original press releases about The Series, Rapunzel, Cinderella, and Billy Goat. 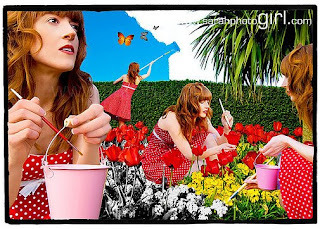 What do you get when you inspire a rock photographer with fairy tales? Some fun, kitcshy and clever images to enjoy, of course. 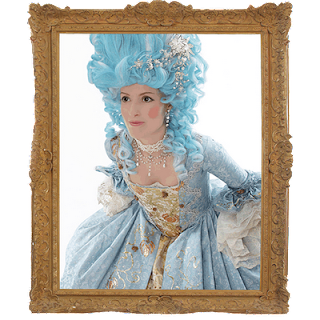 SarahPhotoGirl has a new exhibit featuring fairy tale imagery (some old and some new fairy tales) displayed at Castle Howard in York in Once Upon A Time...with Yorkshire Coast College. The display supplements another exhibit at the castle, Sing A Song Of Sixpence: Children’s Picture Books. Anyway, to encourage you to explore Sarah's work, I won't post the Down the Rabbit Hole. Go find it on her Flickr site or professional website. You can read more about her work on her blog. You can also read more about the exhibit at Sarah continues fairytale career, an article on the Scarborough Evening News site. Explore the darker side of your favorite fairytale characters in this Hack'N'Slash gore-fest platform adventure! Fairytale Fights is a truly twisted hack'n'slash platform adventure where players assume the role of a much-loved fairytale character (Little Red Riding Hood, Jack & The Beanstalk, The Naked King or Snow White), whose glory days have long since passed. While embarking on a seemingly innocent journey to save a colorful fantasy world from certain disaster, players traverse a series of colourful and enthralling levels filled to the brim with action-packed combat and fairytale-style storylines. Luckily, many different weapons lay strewn throughout the fairytale kingdom, which players can use to slice and dice their way through swathes of cute fluffy bunnies and imposing enemies. I'm guessing the Naked King is the Emperor from Andersen's The Emperor's New Clothes. If so, this is the first time I know of him being used in a video game of this nature. I'm rather fascinated by the concept, I admit. I would have imagined another character instead, perhaps Puss in Boots or even Hansel or the Frog King. 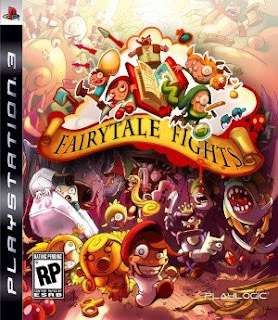 If you want to read more about the game play--I'm not a big game player so I'm only half literate in that language--visit Playstation Life's review at: Fairytale Fights: Putting a Demonic Twist on Your Childhood. The characters are funny although only the girls have been released so far. I'm curious to see how this game sells and is received. I'm not going to debate the violence discussion that may arise. Fairy tales are quite bloody and to me make a rather obvious choice for video game violence, if one is into that kind of stuff. More than anything I am amused and bemused by the game. Of course, this violence is quite different, but I'm interested to see what the game play is like. Ending today, Shine Week is a national festival celebrating the talents of young adults in the UK. I discovered an article with a slightly different twist on the usual plays and mock trials about justice that borrow from fairy tales for storylines. Here's a quote from the article which explains this twist better than I can. Students in Year 10 have been adapting traditional fairytales into a modern play showing the real consequences of crime. The pupils have taken the likes of Little Red Riding Hood to show what trouble can happen to granny and Cinderella to show what happens if a tagged criminal does not meet a curfew. It is the third year the school has used drama to show real issues related to crime and antisocial behaviour. You can read the entire article here: Gateacre school modernises fairytales for Shine Week. I'd never even likened Cinderella's midnight deadline to meeting a curfew. Not sure how I missed that obvious possibility with the story. I think it's a great concept and only wish I could see the play myself. I love the way fairy tales are used over and over again to teach so many different concepts and ideas. From math to law to history, the possibilities seem to be endless. 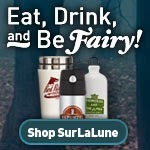 SurLaLune has two exclusive coupon codes for Bookcloseouts.com that expire on August 5. Bookcloseouts sells remaindered and overstock books at great prices. It's like shopping in the bargain section at Barnes and Noble but with a much bigger selection. For example, if you search for "fairy tales," over 200unique titles are listed. I have been shopping at Bookcloseouts.com for almost as long as I've been shopping at Amazon.com. I encourage buying new books because authors receive royalties from the sales and the sales encourage publishers to publish more titles. Sometimes, however, I have found out-of-print titles at Bookcloseouts.com as well as some great deals on books I wouldn't be able to afford otherwise. Bargain books also give you the opportunity to try new authors and books you might not read otherwise due to budget constraints. It's also a great way to pick up extra copies for gifts. I often buy picture books and easy readers for the children in my life so that they have a few extra reading options in their own homes. Just be sure if you fall in love with an author to pick up his or her next title to support them. They need us to buy their books so future ones can be published. All of the book images in this post link to great books available on the site. I'm only listing those with a higher inventory so be sure to do a search on your own to find great books with less than ten copies remaining. If you visit Bookcloseouts.com through a SurLaLune link, SurLaLune also gets a small percentage of your purchase which goes towards supporting the site. The site doesn't get any credit for the coupon codes, those were just gifts from Bookcloseouts for being a longtime affiliate of their store. 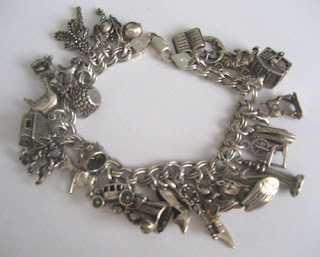 In a previous post about Little Red Riding Hood jewelry, I mentioned my fairy tale charm bracelet. I pulled it out to wear it recently, something I haven't done in a few years. It was a favorite piece of jewelry when I was regularly presenting storytimes and working with children as a librarian. I added to it over a year or so when SurLaLune was young, often buying a charm to commemorate the addition of another tale to the site or receiving one as a gift. The bracelet also makes a fun storytelling device, letting a child choose a charm and then telling her the story that goes with it. Of course, several of the charms represent more than one story, but that only makes it more fun. While my bracelet is overfull and will not be added to--believe me I know it looks like a jumbled mess in the picture above--I went searching on Amazon for more charms to see what was now available. I consequently made a list at Make Your Own Fairy Tale Charm Bracelet. Some of the charms on the list are the ones I chose ten years ago and appear on my own bracelet while others are different. I'm sure other sites have other options, perhaps better ones, but Amazon had a variety and the list making ability. So gawk or be inspired or do both. I didn't find the Fairy Godmother holding a wand to a pumpkin or the Three Bears charms that thrilled me when I found them years ago. But the cat in the boot and others are similar to mine. If you want play 'find the object', here's a list of the charms on the bracelet. You can also play guess the fairy tale(s) they represent for most represent at least two if not more. Charms I wish I had room for or never found: Rose, Harp, Goose, Sun with Moon, Mortar and Pestle, Firebird, Needle and Thread, Unicorn, Dwarf, and so many more! 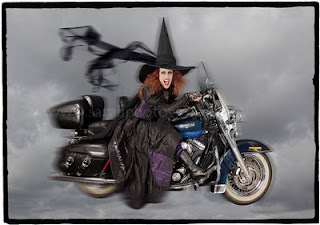 This weekend there will be a fairy tale festival in Nashua, NH. I wish it was in Nashville, TN instead! You can read more about the annual festival at Fairy Tale Festival promoting youth literacy in Nashua. Here's also a press release from the website which I'll copy below. The 2009 SummerFun Fairy Tale Festival has been scheduled for Saturday, July 11, 2009 form Noon-3:00pm at Greeley Park. This year’s theme is Superheroes. Mayor Lozeua will kick things off with a Welcome Address and a fairy tale reading to all children in attendance. All afternoon long there will be on-stage entertainment including musical treats from Enchanted, Peter Pan, The Little Mermaid, Aladdin, Mulan Pocahontas, Hercules, Beauty & The Beast & Lion King. Other events include bounce houses, caricaturist, face painting, fairy art school, food and plenty of games. The festival concludes with a Childrens Parade at 2:45pm. Fairy Tale Festival is free to the public, as is the vast majority of SummerFun Events. At our major events this year, Opening Day, Fairy Tale Festival and Childrens Day, we will be accepting donated food items which will be given to local food pantries. Here's a Monday morning, after the holiday, funny I discovered over the weekend on Failblog. The line is slightly different from the source material--no "and" was needed--but the source material is obviously The Gingerbread Man. It's really bad advice for an evacuation plan, of course, but entertaining all the same. Come to think of it, it didn't work for The Gingerbread Man either, so consider it a cautionary tale when planning an escape. After digging through my files, I rediscovered this craft that I regularly used for Bedtime themed storytimes when I was working as a children's librarian. This was always a favorite with kids and parents, especially after hearing the tale by Hans Christian Andersen. With summer here and so many children out of school, I thought I'd clean it up a little and create a new pattern to share here. When I used this craft with large groups, we used wallpaper scraps to create the mattresses as you can see in the completed image above which was made for me by one of the girls who regularly attended my storytimes. For the SurLaLune version of the pattern, I've created some mattresses out of clip art patterns that can be colored. The bottom blank is the base of the bed or can be used as a pattern for cutting mattresses out of different paper. Of course, the bedposts and base also are wonderful when made out of brown construction paper. The possibilities for adaptation are endless, but if all you have is a printer and some white paper, that's all you need to create this craft. Don't forget to draw a pea or paste a split pea below the lowest mattress. Enjoy! Printing Tips: If you are on a PC, right click over the image to get a menu and save it to your computer. Then use a photo editor program to print it without any clipping of the image. Printing it from the internet browser will most likely cause clipping unless you adjust your printer settings to print to size. Or you can copy and paste the image to a word processing program such as Word and then adjust margins to avoid clipping before printing. This is a smaller version of the pattern for illustration purposes only. Use the links above to get bigger images. Here's another item I'm clearing from my archives as you can guess from the date! This past January AbeBooks shared a list of AbeBooks' Most Expensive Sales in 2008. For SurLaLune, #8 was the most interesting, a copy of Grimms Fairy Tales by Jakob & Wilhelm Grimm sold for $11,388. "A first edition, first issue copy of these famous fairy tales, including 22 etched plates by George Cruikshank. It is housed in a clamshell box." Alas, no pictures were offered--the one provided is actually a volume illustrated by Arthur Rackham instead. However, the wonders of the internet provide the opportunity to see Cruikshank's illustrations for the low price of your time and internet access. I have posted many of his illustrations in the SurLaLune Illustration Gallery at George Cruikshank. These are older scans, some of the first I made for SurLaLune from a later edition of Cruikshank's work. Of course, Cruikshank was not a romantic and his style is not as popular as Rackham and the other Golden Age illustrators, but he was influential and popular. He was chosen to illustrate the first English translation of the Grimms' work and his drawings are insightful and humorous and had much less to draw from for inspiration since he was one of the first to illustrate the tales. Also don't miss the images from the Bedtime Story Project. I admit I'd prefer to have these sheets in real life to the fabric I posted earlier by Heather Ross, but alas, they were produced strictly for this art project, not for retail distribution. However, there are more direct fairy tale influences especially from the Princess and the Pea and the Frog Prince. You can read more about her influences and design decisions on this page Far, Far Away for Kokka of Japan as well a more recent post in which she lists online retailers selling the fabrics internationally at Finding Far, Far Away Fabrics Online. I didn't explore all her links, but found that PurlSoho.com has fine swatches at Far, Far Away. Thanks to Valerie S. for passing along the original post about this fabric late last year. Once again, I've been collecting stuff for a blog for a long time.